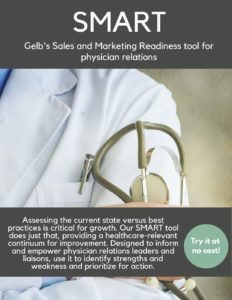 Our best practice physician relations benchmarking tool is used by national leaders in healthcare to assess their performance and progress. We now offer this tool via a free online survey and PDF report. Subscriptions are also available which include comprehensive access allowing you to compare to peers and a customized presentation to energize your efforts in developing stronger referring physician relationships. Take the brief survey now.